Is Occupy Central a Scam? Here’s an interesting column piece today. An activist who contributes to AM730, a local Chinese language newspaper, commented on Occupy Central, a hot topic that pan-democrats and pro-Peking individuals debate and talk about an awful lot recently. Jimmy Lai, Martin Lee and the old hands, who are long perceived to be leaders of pan-democrats, have voiced their support for the “Occupy Central” proposal raised by Professor Benny Tai. All those who criticise the framework of their activity or those who are disappointed by the fact that no formula has been agreed for Hong Kong’s “general election” over the past decade (the standard which says “(it must) fulfill international human rights” eventually came out – Wow! And the Pope is Catholic!) are categorized as “intend to resolve the issue with violence, want to see bloodshed, want to hijack the activity” – some pro-democrats even questioned: if not doing it this way (peaceful demonstration that does not disrupt the social order), what other ways are there? Are we just going to sit and do nothing? In 2010, Democratic Party had a closed door negotiation with China Liaison Office about Hong Kong’s political reform, Helena Pik-wan Wong, the Deputy Convenor of the Alliance for Universal Suffrage, asked the public to wait for another 8 years (before HK can have universal suffrage in general election). The opposition then was also condemned to be dividing the pan-democrats, causing troubles, etc. Some questioned the opposition “if we do not pass the reform bill, what are we going to do? (Isn’t that better than) making no progress at all?” Where these very words are still vivid memories, the same thing is happening yet another time. In the past, Hong Kongers looked up to the 4/June movement and saw it as the “halo” of democracy (a common term of reference to describe the holiness and nobility of a movement, I’d use “holy grail” in the following as I find it translates better, the word halo rhymes with Central in Cantonese). Those leaders who sacrificed touched people’s heart. Over twenty years have passed, those who passed away are still heroes, but to Hong Kongers they are not as close and powerful to us as the immediate threats and pain we face daily as our culture and livelihood being tormented and facing the ever intensifying chinafication. Out-dated politicians are still holding on to the halo today. They failed to grasp the change of people’s sentiments. Instead, they turn to focus on constructing a scam that can bring them a new holy grail. To them, there isn’t much time left (why did they ask people to wait for a few years then? Shouldn’t they have apologised for betraying the people of Hong Kong? ), they have to find something to do. Occupy Central is certainly a powerful civil disobedience action. Whether or not it will bring universal suffrage in general election is still a mystery; joint resignation by pan-democrats at the Legislative Council to trigger bi-election, a way lower cost method for people to express their views compare to ten thousand people being arrested voluntarily (as suggested in the Occupy Central proposal), is not accepted; a complicated “Occupy Central guideline” that the general public doesn’t understand suddenly appeared. All these aim at prolonging their possession of the holy grail to secure the value of their continuous existence. Come on! Hong Kong’s glorious era belongs to them. The dream of Hong Kong’s democracy belongs to them. The way they design and set out is the only way. “War is young men dying and old men talking”. Young thoughts always come to destroy (the old). As stated in Hong Kong Basic Law, Hong Kong’s mini-constitution, by 2007 Hong Kong people have the rights to elect their own leader, i.e. the Chief Executive. In 2004, the National People’s Congress of Communist China interpreted Basic Law to deny such rights, and in 2007 the NPC once again denied the universal suffrage of Chief Executive of Hong Kong. This constitute a breach of contract (i.e. Sino-British Joint Declaration). Nothing has changed so far. The “political reform” proposed by the Hong Kong SAR government clearly shown that PRC has not intention to demolish functional constituency (members of this constituency are not elected by all the people of Hong Kong, but a small group of so-called elites). The Democratic Party engaged in a closed door negotiation with the Liaison Office of the Central People’s Government and voted for this proposal which essentially represents a decline of democracy in Hong Kong. 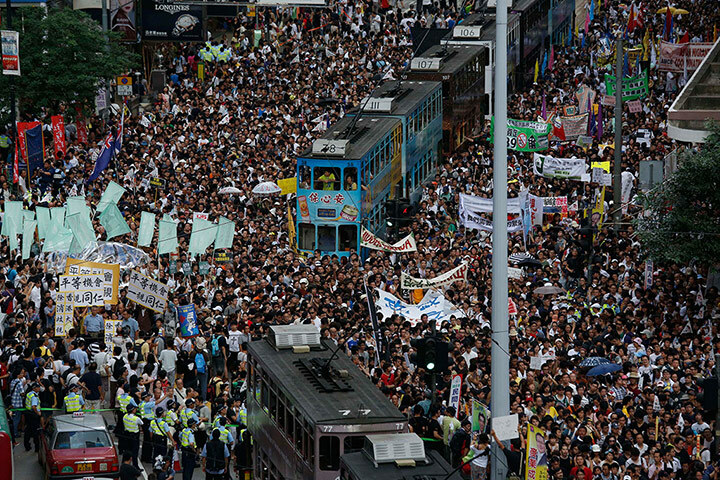 With the background above, the people of Hong Kong are increasingly displeased with China’s continuous interference of Hong Kongers’ rights and the hindrance of Hong Kongers’ demand for a democratic society. In January 2013, Benny Yiu Ting Tai, an associate professor at The University of Hong Kong, announced his “Occupy Central” proposal. The proposal (as it develops over time) includes 7 steps: 10,000 participants signing declaration (taking a vow and pledge that they’re willing to take it to the street), live TV broadcast of discussion, electronic voting on formula (of universal suffrage), referendum on formula, Super-Seat Legislative Council member resign and trigger another referendum, legal and affect-no-social-order movement, occupy Central in July 2014. The notion Occupy Central received a lot of attention, and supports of the public when it was first announced (without any of the above steps). However, as Professor Tai’s theory develops, debates arise – will this actually work? 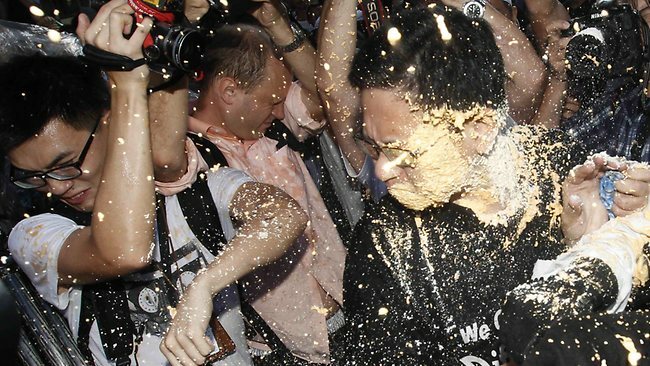 Hong Kong has been fighting for universal suffrage of its own Chief Executive for a long time. The bottom line for any democratic election is that candidates running for the leader of a society election will not be sift from a number of candidates by any sort of committee and finally be elected by the people – 1 person 1 vote. All Legislative Council members are elected by the people, again 1 person 1 vote. The pro-Peking (PRC) individuals jumped out to defend China’s position recently as the debate heats up. There are reports and rumours saying that there will be a “pre-election” before the universal suffrage in 2017, meaning a selection of candidates will be elected by a committee controlled by the PRC. The PRC government officials also said that “the CE must love China and love Hong Kong”, putting China in front of Hong Kong, the place the CE will govern, and setting “love China” as a criteria is simply not acceptable nor necessary. The same official also said that “PRC will not accept a CE that is not patriotic” – this means that Hong Kong people ruling Hong Kong is only a myth. Not to mention the fact that PRC as a nation is hijacked by the China Communist Party, if one is not loyal to the Party means that he/she is not patriotic. Regina Ip (former Security Secretary in Hong Kong who pushed for Article 23) even said “pre-election” exists in any democratic society. This is complete rubbish – the so-called “pre-election” in democratic societies are elections each political party hold to choose the representative from the party to run for office.